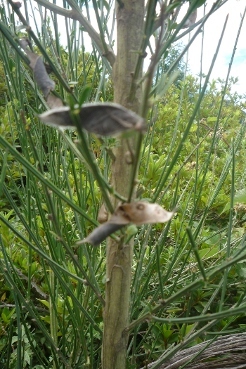 Cytisus scoparius L. is a perennial shrub of 1-3 m tall, with main stems up to 50 mm thick, rarely 100 mm. Leaves alternate, hairy, trifoliate, 5-15 mm long. Flowers yellow. Pods mature black, 20-30 mm long, 8 mm broad and 2-3 mm thick. The pod dehisce with an audible crack, dispersing the seed away from the parent plant. Flowering time: late summer. Scotch broom is native to Western and Central Europe and is invasive in California, North America, Australia and New Zealand. The species was introduced to South Africa for ornamental purposes. It has been recorded in Eastern Cape in Hogsback area including Hogsback Forest Reserve, KwaZulu-Natal (south west of Escourt at Ulundi, Nottingham Road to Loteni, Underberg to Swartberg and Highmoor Forest station) and in Free State in Van Reenen. 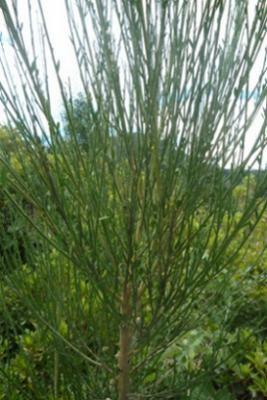 Scotch broom is aggressive and competes with native species, reducing recruitment of seedlings and growth of native species in open forest areas. It mainly invades grassland and forest margins especially on the lower slopes of the Drakensberg in KwaZulu-Natal. It also invades disturbed areas and woodland. Scotch broom spreads mainly by seeds. There are no registered herbicides for this species in South Africa. It is currently controlled by cutting.